In the tenth pAsuram, AzhwAr sustains himself thinking “krishNa who is the young toddler of cowherd clan, without checking AzhwAr’s qualities/defects due to his childish ignorance, will bestow SrIvaikuNtam which is difficult to attain”. Subsequently, AzhwAr says “krishNa who protected his own people such as SrI vasudhEva, pANdavas et al by eliminating their enemies, will bestow SrIvaikuNtam to me”. See nanjIyar‘s introduction. See nampiLLai‘s introduction. Tenth pAsuram. AzhwAr explains that emperumAn is the goal, he is the means to attain himself, and he is the one who eliminates the hurdles; as there is no shortcoming to obtain the result in this manner, AzhwAr determines that emperumAn will bestow himself to self. 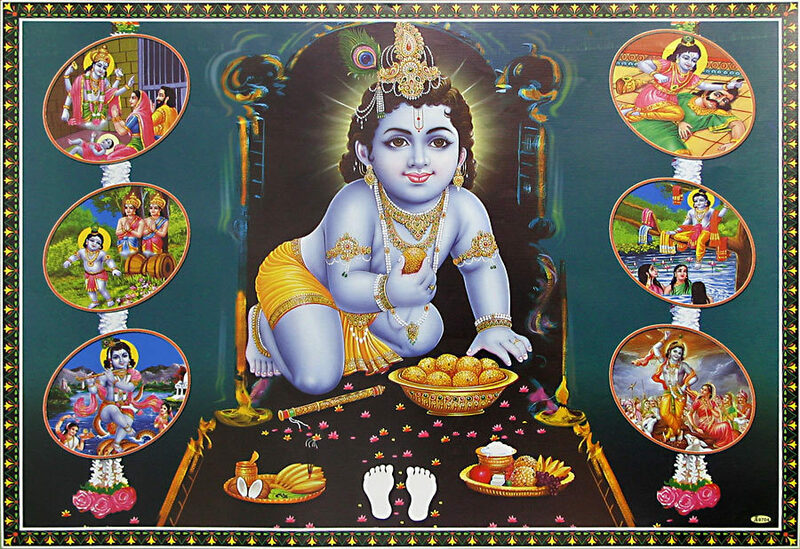 Being a very infant child, krishNa entered the cowherd clan and became one with them; he was engaged in very amazing acts such as killing puthanA, Sakata, yamaLArjuna et al and killed kamsa who was having the nature of death which separates body and soul; he destroyed cruel dhuryOdhana’s army for the sake of pANdavas; with great patience, having infinite glories, he set out to enter into paramapadham which is known by the term “param jyOthi”; such krishNa who is like a great lion, will bestow SrIvaikuNtam which is having nature/qualities which are inconceivable even by the mind and speech of great yOgis, for us. emperumAn who is the eliminator of all hurdles as said in “sarvapApEbhyO mOkshayishyAmi“, will also bestow the result to us to eliminate our suffering as said in “mA Sucha:“. ERRarum vaigundhaththai aruLum – He himself will bestow SrIvaikuNtam which is unattainable by one’s own effort, to us [who will get it from him only]. Ayar kulaththu IRRiLam piLLai – He is a toddles who cannot see our nature [i.e. faults]. It is said in sthOthra rathnam 63 “mugdha sAyujyadhO’bhU:” (Oh krishNa who doesn’t know [care for] any defects! You bestowed SiSupAla with liberation). Here, the words can be split in a couple of ways; a) having IRu at the end, as in “IRAna iLam piLLai” – meaning infant. Alternatively, as in “InRiLam piLLai” – which is “kaRRiLam piLLai“. In both usage, the meaning remains “infant” only. onRAyp pukku – kamsa, krishNa’s maternal uncle invited him mischievously for “vil vizhavu” (archery festival), and krishNa too mischievously considering himself to be the main participant, went in. Alternatively – krishNa entered mathurA having the archery festival as a reason to go in there. mAyangaLE iyaRRi – Performing amazing acts such as entering the weapon storage area and breaking the weapons, killing the washerman and wearing the clothes he had, breaking the tusk of kuvalayApIdam, the elephant, killing the wrestlers etc. As kamsa heard krishNa’s actions, he rose angrily like the deity of death. kURRu iyal kanjanaik konRu – krishNa dragged kamsa who was seated on the throne to have his face hit the ground and killed him. ammAL explained the meaning of SrIvishNu purANam 5.20.84 “vigaLath krIdamavanIthalE pAthayAmAsa” (krishNa, pushed kamsa to ground to have him lose his crown) as, “as when one kills traitors (coming in the dynasty), one will withdraw their royal symbols and then kill them; here krishNa killed kamsa after taking his crown away”. As kamsa was allowed to be king by emperumAn only, he first withdrew the royal symbols, to let others have faith in the royal system. Hence, in the early life, emperumAn escaped from those who were sent by kamsa and kamsa himself. Once he became old enough and realised himself, he helped pANdavas. aivarkkAyk kodum sEnai thadindhu – As those who were angry at pANdavas were screaming “sArathi” repeatedly and were running towards him, he rode over them with his chariot and killed them. ARRal mikkAn – Even after uprooting the enemies, crowning dharma puthra (yudhishtra) and having draupadhi tie her hair, he mercifully returned to paramapadham saying “nAthisvasthamanA:” (I am not having a satisfied mind). ARRal indicates poRai (patience). Alternatively, it means vali (strength). Implies, he has the strength to destroy everything. periya paranjOdhi pukka ariyE – Even after reaching paramapadham where kamsa, dhuryOdhana et al are not present, instead of thinking “we are amidst the nithyasUris”, he remained with the same anger of dealing with kamsa, dhuryOdhana, karNa et al and holding the weapon. This entry was posted in thiruvAimozhi, thiruvAimozhi 7th centum on October 4, 2018 by Sarathy Thothathri.